Hurricane Spin Duster™ | Official Site | The New Cordless Power Duster That Makes Cleaning Faster And Easier! The New Cordless Power Duster That Makes Cleaning Faster And Easier! Hurricane Spin Duster™ catches all the dust; just turn it on! The extension handle even cleans up hard to reach cobwebs! Dusting is the worst. Spraying and wiping all day is back-breaking work and feather dusters make such a mess. From the makers of Hurricane Spin Mop™ comes Hurricane Spin Duster™. It's the lightweight, portable spinning duster that is like a Hurricane® of clean! READ FULL DESCRIPTION Spin Duster doesn't move dust around like a feather duster. It uses static electricity to pick up dust like a magnet. The secret is thousands of electrostatically charged bristles that attract and trap dust so nothing is left behind. Just press the button and it spins into action. Evict those dust bunnies with a single spin. The Hurricane Spin Duster™ makes cleaning and dusting impossible places like bookshelves and blinds easy. Eliminate dust and get a deep clean! Spin Duster™ gets deep into corners and crevices, conforms to fixtures and fittings, and gets in and around hard-to-reach places like magic. The ultra-soft dust grabbing fingers leave a path of clean. Dust without having to move a thing! Hurricane Spin Duster™ works dry to you don't need to use a dust spray. It's the lightest and easiest way to dust. When you're finished cleaning, just rinse the head and let air dry. Then it's ready to go! Say goodbye to feather dusters or cleaning with a dirty rag. Clean the impossible and make dusting fun again with Hurricane Spin Duster™! Get your Hurricane® Spin Duster™ for only $19.99 plus S&H. As our gift to you, we'll include the mini dust head and extension wand! But wait! You can double your offer and get a SECOND Hurricane® Spin Duster™ set. And we'll include the Hurricane® Dust Lizard so you can easily vacuum up dust and debris with precision. Just pay a separate fee of $9.99. Hurry - order now! Just turn Hurricane Spin Duster™ on and it'll pick up dust with ease. Thousands Of Electrostatically Charged Bristles Attract And Trap Dust So Nothing Is Left Behind. Hurricane Spin Duster™ Conforms To All Shapes And Sizes, And Gets Into Nooks And Crannies! Hurricane Spin Duster™ is safe to use on all kinda of surfaces. 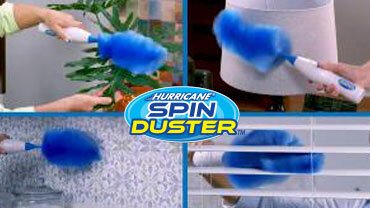 OFFER: Get your Hurricane Spin Duster for only $19.99 and receive FREE shipping and handling. As our gift to you, we'll include the mini dust head and extension wand! But wait! You can double your offer and get a SECOND Hurricane Spin Duster set. And we'll include the Hurricane Dust Lizard so you can easily vacuum up dust and debris with precision. Just pay a separate fee of $9.99. Hurry - order now! GUARANTEE: Your satisfaction is 100% guaranteed. If you are dissatisfied with your Hurricane Spin Duster for any reason, simply return the product within 30 days for an easy refund of your purchase price, excluding shipping and handling. See our return policy for more information. Exceptions may apply.